New Delhi: A ‘new wave’ of non-metro cities is rapidly closing in on the eight metros in terms of consumption, media penetration and investment opportunities, emerging as key target markets for businesses, says a report published by consulting firm EY. These non-metros are “markets with the greatest gap between demand-side consumption and supply-side penetration," said the report titled India’s Growth Paradigm: How markets beyond metros have transformed. 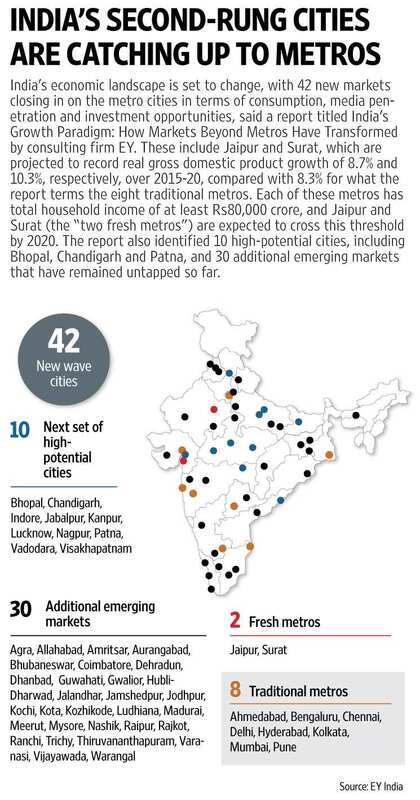 The report identified 42 ‘new wave’ markets including the two new metros—Jaipur and Surat—and 10 high-potential cities including Bhopal, Chandigarh and Patna besides 30 additional emerging markets that include Agra, Amritsar and Raipur. “Taken together, these 50 cities (eight metros and 42 new cities) represent the key urban markets for businesses, marketers and investors to target," the report said. The report comes as a wake-up call for companies that continue to define their market, marketing and investment plans through a narrow lens focused on just the top handful of cities. The report highlights the potential in each of these markets that so far have been largely untapped by packaged consumer goods makers, retailers, e-commerce firms and telecom companies. The growth of these cities is being driven by increase in population and investment besides various government initiatives. “Urban clusters are driving this growth; more consumers and more purchasing power is emerging beyond the metros, particularly in tier II/III cities," the report said. The findings of the study are based on 70-odd parameters including household income, per capita income, investment opportunities, savings rate and the number of retail outlets in the 50 cities. “Based on all these parameters, we have analysed the cities where the growth is happening or where we expect the growth to happen. The spread of marketing is quite high because consumption is genuinely happening across a much wider base," said Ashish Pherwani, media and entertainment advisory leader at EY India. Pherwani explained that the eight Indian metros—Ahmedabad, Bengaluru, Chennai, Delhi, Hyderabad, Kolkata, Mumbai and Pune—each have household income of Rs80,000 crore. By 2020, Jaipur and Surat will also touch the Rs80,000 crore mark. Both cities are projected to record real GDP (gross domestic product) growth of 8.7% and 10.3%, respectively between 2015 and 2020, compared with 8.3% for the eight metros. Consumption in the two cities will reach 75-80% of the level recorded by metros like Pune and Ahmedabad by 2020, according to the report. The report has identified Jaipur, Jamshedpur, Kota, Mysore and Nagpur as some of untapped markets for retail, fashion and consumer durables’ brands. “The focus of companies today and the majority of ad spends are still concentrated in the top handful of cities. But as India matures, significant consumption and ad spend growth is coming from aspirational smaller towns. We are seeing major clients in industries like FMCG and Auto getting strong feedback from Tier II/III cities and refocusing on the same, though such shifts are generally category- and client-specific," Shashi Sinha, chief executive officer at media agency IPG Mediabrands, said in the report. Additionally, with cable digitization, rising vernacular print circulation, smartphone adoption, new private FM radio stations coming up and expansion of multiplexes, the penetration and consumption of media across these markets has also seen a rise. The 42 new wave markets have 0.88 times the TV households, 1.26 times the direct-to-home television households and 1.06 times the print circulation of the metro cities, the report said.